The Ash Wednesday Storm of March 6-8, 1962, did considerable damage along the Outer Banks. Interestingly, just a few days ago another winter storm (dubbed "Riley" by the Weather Channel*) battered the Northeast, including the Outer Banks. Although Manteo and Hatteras Island experienced coastal flooding, Ocracoke was spared rising tide water, but sustained gale force winds. This sailboat in Silver Lake was blown onto the shore near where Ride the Wind stores their kayaks. "A spring storm has washed out some of the roads and has damaged Cape Hatteras national seashore park on North Carolina's fabled Outer banks, described in an article in the April I Travelers' Guide. 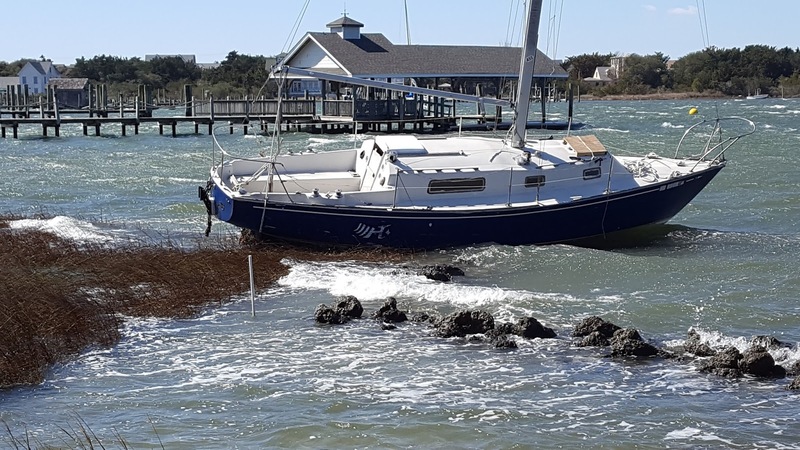 But increased ferry service to Hatteras and Ocracoke islands and a temporary bridge spanning the new inlet cut thru Hatteras island by the storm are facilitating travel to the Outer banks as the prime salt water fishing season begins. Accelerated summer schedules for the free state automobile ferries operating across Oregon and Hatteras inlets are effective thru Sept. 7. A toll ferry, Sea Level, links Ocracoke and Atlantic on the mainland." * The National Weather Service does not recognize The Weather Channel’s names for winter storms.